Reading: A Golden Cage by Shelly Freydont and Scarlet by Marissa Meyer. I'm also rereading It Happened One Autumn by Lisa Kleypas. Listening: Live and Let Die by Ian Fleming - I'm not like it nearly as much as Casino Royale but it's still entertaining. Watching: J and I are still watching The Blacklist. We're about halfway done unless Netflix gets the 3rd season soon. I'm taking a break from Supernatural and watching 1800-Missing which was on probably around 2006 and loosely based on the Meg Cabot series by the same name. I wouldn't say it's quality but it is entertaining. I'll probably go back to Supernatural soon. We are now officially done with school! Paul's graduation was Tuesday and it wasn't quite as long as I expected. The class size was just under 600 but they moved through them pretty fast. It was a bit more emotional than I expected because it really brought home that my days of running a big family are done and I'm a little sad to see that chapter come to an end. We had a bunch of appointments Wednesday and then a super lazy Thursday and Friday so I'm no longer feeling like I've been hit by a truck which is nice. I'm hoping we'll be getting together with friends soon. There's a walking trail around a playground here so my friends and I can run while the Tornado and his friends are playing. It would pretty well. I'm also wanting to get to the Botanical Gardens here. They have a new exhibit on habitats and he always enjoys a visit. I've been using the downtime to get somewhat caught up on blog stuff. I'm not quite where I want to be but I'm definitely making progress. I'm also aware that we're coming up on the halfway point for the year and I'm trying to reevaluate my reading to decide if I want to change things up or direct my focus somewhere. My main goal is to get caught up on review books but I'd also like to read more out of my comfort zone. I've done some this year and enjoyed it but I'd like to keep expanding. I loved Rebecca, so now I'm curious about The Readaholics and the Gothic Gala. Because I really enjoyed The Weird Sisters, I'm also intrigued by The Light of Paris. Enjoy! Have a great weekend. I see Scarlet. How are you liking it so far? I hope you enjoy Scarlet. I just finished off the series (minus Stars Above). I bet it feels weird to know that the family you'll be in charge of is kind of changing, Katherine. Two of my children are graduating this spring, too, and they'll both work next year - they have their contracts already. I think they'll stay home with us for another year, though, as rent is so expensive here, but the dynamics will definitely be different. Glad the graduation went well. There is something nice about school being over too and just being able to relax into the summer. The botanical gardens exhibit sounds great. Enjoy! I need to read Rebecca and it's on my wishlist. That cozy series sounds really cool. I haven't tried The Backlist but I love James Spader so I should..lol. Sounds like it's going to start getting a bit more quiet around your house, but I am sure you will get use to it. :) I don't have kids so I have no clue how you are feeling. Glad the graduation went well and you also got some time at the end of the week to be a little lazy :) Hope you are enjoying Scarlett - Have a great week!! I love it when I get approved for a book that I didn't expect to get. Happy dancing is required in those cases. I am glad that the graduation ceremony went well for you. It is exciting to see your kids grow up but a little sad at the same time. Have a great week! Glad the graduation went off smoothly. We are currently on half term break and so I have a chance to take it easy. I enjoyed your review of The Guernsey Literary and Potato Peel Pie Society - they did an audio version for Radio 4 a few years ago, which I thoroughly enjoyed. Have a happy week reading and blogging. That looks like a great cozy mystery series to get into. I added that. I liked the Weird Sisters. It was different and each sister had real personality. Added the soon-to-be published new one. Congrats on raising a successful young man. I still have a ways to go but time flies; my tween is graduating from 6th grade which is more like a formality for us since she graduated from fifth in the city, but I can't believe she's going to junior high in August. Rebecca is a great book, love Du Maurier! The botanical gardens sound gorgeous, I'd love wandering through all that nature. Oh, The Blacklist is such a great show! Happy reading! With the mid-year point upon us, I need to rehaul all of my blog housekeeping. I have been heavily neglecting it. I'm also going to get my Bloglovin set up properly and under control. Congratulations on the graduation. Looking forward to the Eleanor Brown book. Hope this is a great week. The end of the school year and especially graduations always left me deflated and at sea for a day or two, when all of a sudden the ten thousand things associated with the kids suddenly dropped to only a thousand. We usually took a beach trip the first week - the kids loved it. Going outside your genre for review can be daunting - I was challenged by Rosie Amber and have now done YA, paranormal, action, and even a romance, although that is one area I really do not enjoy. I do hope you have a great summer. My third book is out in early July and I'm in the gully before I get the proofs! Congrats to the graduate! l loved that Kleypas book and should read more of hers. Have a good week! Both of your new books sound great. Any cozy series that follows a book group has got to be good, especially if Rebecca is involved! I never got around to reading The Weird Sisters either, but this one sounds really appealing. Congratulations on the graduation. Somehow they are always bittersweet... and signal life changes for the kids as well as the parents. Hope you have a good week! How are you liking Scarlet? More, less or same as Cinder? I love Wolf and Scarlet. And of course Throne. Or parenthood, I can just imagine that time goes by even faster as a parent. I hope you guys are able to have a lovely summer together though. Congratulations to your son! My daughter also graduated from high school and it was a long ceremony since there were over 700 kids. But it did go fast when the kids walked the stage. It was an emotional day for me too but my daughter will be going to a community college close by so she'll be still with us. I'm fine since I'm not ready yet for her to leave home lol. It's nice now that the kids are on vacation. I hope you have a great week! 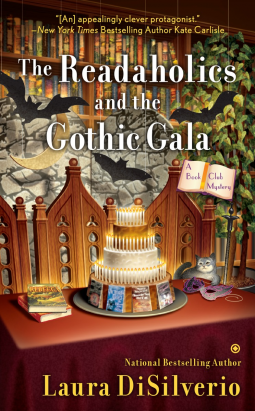 I just love that cover for The Readaholics and the Gothic Gala. Sounds like a fun book. :-) I just read a very positive review of The Weird Sisters that got me interested. I hope you enjoy The Light of Paris! I just watched the season finale of the most recent season of Blacklist. Is that the third? I'm so bad at keeping track. I have mixed feelings about the season, but enjoyed it more than not. I hope you are doing well, Katherine. I'm sorry I haven't been around. Things have been hectic and getting online has been a bit of a challenge at times.